Brett Weiss is a man who loves lists. He also loves games, and it was only a matter of time before he combined these passions and nature took its course. The product of several thousand hours’ worth of research, the Classic Home Video Games series of books has been available for some time but it is only now that I’ve had the opportunity to get hold of a volume from the collection and see what all the fuss is about; and I must say it was definitely worth the wait. The Classic Home Video Games series spans every home console from 1972 up to 1990 and each entry is split into a certain period in video games history. If you’re reading this article now, the chances are that you collect retro video games in some capacity; or at least have an interest in the subject, and so this series of books is quite possibly something you’d be interested in knowing more about. The volume I have is the third in the series and covers the period 1989 – 1990. Now this may seem like a relatively small span of time in the great patchwork pantheon of video gaming, but it may surprise you to learn that in this window, the Sega Genesis, TurboGrafx-16 and Neo-Geo AES were all released in the US. I make this pertinent point to use the NTSC-U monikers for these systems because this series of books is primarily focused on the American market, but regardless of where you live the sheer level of detail contained within the pages is astounding. Coming in both soft and hardback flavours, each entry the Classic Home Video Games series lays out the systems that were released in North America in that particular period (and are split into 1972-84, 1985-88 and 1989-90) . Every chapter begins with an introduction and a short history of the console in question, and Weiss details his own experiences with each. And this is really where the books differ from some other list-based publications – the author is an avid gamer and shares his personal opinions and experiences with each and every piece of hardware featured. Not only this – and here’s the money shot – the books go on to detail every single North American release for every system, and also feature paragraph-long reviews detailing good points and bad, gameplay mechanics and if there are any other versions of the game available. You’ll also find box scans and images of the consoles dotted throughout, and though these are in monochrome they are a welcome addition and break up the text nicely. I found volume 1989-1990 especially interesting as I have recently started to collect Neo-Geo CD games, and while it is the AES that gets the main bulk of the SNK-related chapter, the text details if a Neo-Geo CD port was released and also if there are any major differences. For someone in my position (that is, a relative n00b when it comes to SNK hardware and software), this is extremely useful and has helped me decide whether certain games are really worth my time. Further on, every North American Genesis game is given a mini review, and the same is true of the TurbGrafx-16 (aka PC Engine) library. The appendices also surprised me, as they go on to list every US Sega CD, Sega 32X, Nintendo Gameboy and Atari Lynx release, and include a one line review to detail what the game is. 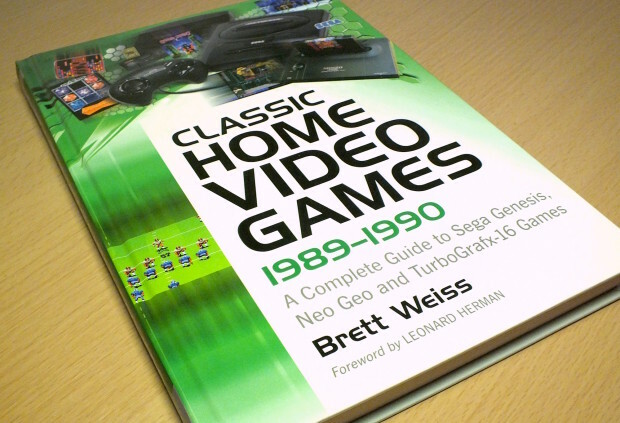 In closing, if you are a collector of Genesis, Neo-Geo or TurboGrafx-16 games, I would wholeheartedly recommend this 300+ page tome not only as a worthy guide, but also as a great extra addition to your library of games-related reading material.